Edited by organizers of “Digital Classicist” seminars in London and Berlin, this volume addresses the impact of computational approaches to the study of antiquity on audiences other than the scholars who conventionally publish it. In addition to colleagues in classics and digital humanities, the eleven chapters herein concern and are addressed to students, heritage professionals and “citizen scientists”. Each chapter is a scholarly contribution, presenting research questions in the classics, digital humanities or, in many cases, both. They are all also examples of work within one of the most important areas of academia today: scholarly research and outputs that engage with collaborators and audiences not only including our colleagues, but also students, academics in different fields including the hard sciences, professionals and the broader public. Collaboration and scholarly interaction, particularly with better-funded and more technically advanced disciplines, is essential to digital humanities and perhaps even more so to digital classics. The international perspectives on these issues are especially valuable in an increasingly connected, institutionally and administratively diverse world. This book addresses the broad range of issues scholars and practitioners face in engaging with students, professionals and the public, in accessible and valuable chapters from authors of many backgrounds and areas of expertise, including language and linguistics, history, archaeology and architecture. This collection will be of interest to teachers, scientists, cultural heritage professionals, linguists and enthusiasts of history and antiquity. Digital Classics Outside the Echo-Chamber is mainly addressed to Digital Humanists. It showcases exciting methodological examples of the application of digital tools to the Humanities, and demonstrates their impact on pedagogy and public outreach. In the last two decades, Classics has grown to be one of the most technically advanced humanities fields. Developments in the archaeological sciences and ancient geography, the availability of 3D reconstructions, digitized textual corpora from epigraphs to papyri, treebanks, morphological analyzers, and POS taggers for Ancient Greek and Classical Latin all signal the field’s technological advance. Increasing popularity and quality of its scholarly outputs has combined to confer proper disciplinary status to the Digital Classics. Indeed, it is now difficult to imagine new research in the fields of Classics without the employment of some well-tested methodology involving the use of digital tools. The volume under review collects a number of excellent contributions that explore the potentials of Digital Classics outside their comfort zone (what editors Gabriel Bodard and Matteo Romanello call their “echo-chambers”), either by applying their techniques to different contexts, or, by importing techniques from the sciences and applying them to the Classics. The book’s final section continues its “outside the echo-chamber” approach by closing with three chapters that deal with how to better engage the general public and adapt Classics resources to be more easily accessible for a non-academic user. The editors open their book with a detailed discussion of its aims and an introduction to the portal http://www.digitalclassicist.org/, with which Bodard has been involved since founding it in 2004. The Digital Classicist website has become an important discipline-wide resource, collecting information about most digital classics projects, and also hosting a blog and a discussion list. Bodard and Romanello are also the active force behind the successful Digital Classicist seminar series that has been staged in London and Berlin for several years. Indeed, some of the papers contained in this volume were originally presented as works in progress during those seminars. In their introduction, Bodard and Romanello stress our collective responsibility as scholars of the classics to communicate to the wider public the importance of the outcomes of our work. In their view, classicists need to engage students in new and stimulating ways that keep pace with the rapid development of technologies offered by the world outside academia, urging that we must find ways of applying their techniques, even if seemingly distant from our subject, to resolve questions and problems that are still unanswered and unsolved. The book is divided into three main sections: 1) Teaching, 2) Knowledge Exchange, and 3) Public Engagement, each reflecting the editors’ overarching theme of the need for open access to digital resources. Chapter 1, “Learning by Doing: Learning to Implement the TEI Guidelines Through Digital Classics Publication” by Stella Dee, Maryam Foradi and Filip Šarić, focuses on how adult learners with existing knowledge in the humanities, specifically in the field of Classics, can approach and learn the TEI guidelines for the encoding of structured data in XML in a digital (online) environment. It includes a short digression on the history of learning methods, from ‘chalk-to-talk,’ to class discussion, and to more recent digital learning approaches for students of higher education. The chapter emphasizes that classicists need only to learn about TEI in relation to their particular activities or projects. Chapter 2, “Open Education and Open Educational Resources for the Teaching of Classics in the UK” by Simon Mahony, explores lessons learned about the potentials of Open Educational Resources (OER) during the conduct of three projects aimed at the creation, use, and re-use of online educational resources for the teaching of Classics. This chapter dwells on the lack of OERs for Classics and regrets how the state of the art in this area is still palpably behind that of other disciplines. Chapter 3, “Epigraphers and Encoders: Strategies for Teaching and Learning Digital Epigraphy” by Gabriel Bodard and Simona Stoyanova, contains a history of EpiDoc training that lays out how this practice evolved over time to include what is currently being taught in free EpiDoc training sessions. This narrative is accompanied by observations about how the teaching of EpiDoc and Epigraphy can be compared, where they overlap, and whether they indeed can be brought together in a unique teaching module keyed to future Epigraphy instruction. Chapter 4, “An Open Tutorial for Beginning Ancient Greek” by Jeff Rydberg-Cox, describes an online tutorial of Ancient Greek targeted to non-specialists based on the digitization of a 19th century Ancient Greek reader into HTML. Users of this resource can follow their learning progress by taking a series of multiple-choice quizzes while their interest is stirred by a gamification environment. The author exposes data on the hits received by his website (15,178 visitors visited the website 58,137 times in 2014 alone), and argues that the popularity of his resource proves that people are still interested in Classical subjects. According to Rydberg-Cox, digitized material is useful for spreading information to audiences that would otherwise not be able to access Classical knowledge. On the opposite spectrum of Ancient Greek and of language resources expertise, Chapter 5, “The Ancient Greek Dependency Treebank: Linguistic Annotation in a Teaching Environment” by Francesco Mambrini, argues that employing manual linguistic annotation in the classroom, specifically the Ancient Greek Dependency Treebank, can be very effective in the teaching of Ancient Greek syntax. Mambrini also argues that hands-on work helps students become familiar with Ancient Greek philology. He compares meticulous annotation in a controlled environment to a form of close reading that helps students learn about Greek civilization, as well as morphology and syntax. 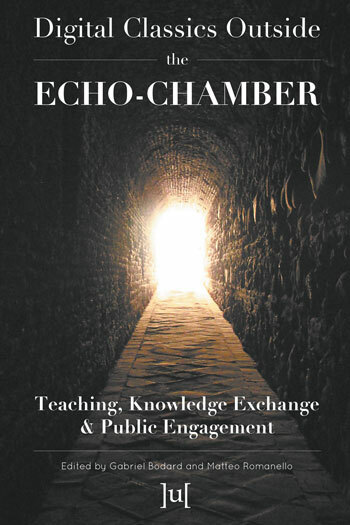 Section 2 of Digital Classics outside the Echo-Chamber focuses on Knowledge Exchange, which it defines as the practice of bringing together experts from different disciplines in order to advance science. In Chapter 6, “Of Features and Models: A Reflexive Account of Interdisciplinarity across Image Processing, Papyrology, and Trauma Surgery”, Ségolène Tarte discusses how intricacies and difficulties can be anticipated in multi-disciplinary projects. Drawing on her experience in applying image processing expertise to both papyrology and trauma surgery, Tarte underscores the value of a practitioner’s full awareness of differences between fields, be they in the meaning of certain crucial words (e.g. feature, models…) or in field-specific epistemologies, while raising the crucial need for more effective communication strategies than those currently in place. Chapter 7, “Cultural Heritage Destruction: Experiments with Parchment and Multispectral Imaging” by Alberto Campagnolo, Alejandro Giacometti, Lindsay MacDonald, Simon Mahony, Melissa Terras and Adam Gibson, deals with the benefits of multispectral imaging when handling degraded parchment. Campagnolo et al. describe a cultural heritage project involving three distinct disciplines (medical physics, image science, and manuscript conservation), wherein medical physics phantom images are used to model damage to manuscripts and multispectral imaging is applied to better understand this damage macroscopically. The authors point out how experience accrued during their project could be beneficial to other branches of conservation, thereby demonstrating again the value of looking outside the echo-chamber. In Chapter 8, “Transparent, Multivocal, Cross-disciplinary: The Use of Linked Open Data and a Community-developed RDF Ontology to Document and Enrich 3D Visualization for Cultural Heritage,” Valeria Vitale addresses the use of standardized methods like Linked Open Data (LOD) for the classification of 3D objects. 3D visualizations of cultural heritage comprise a field that still lacks common methods or standards. Vitale proposes an appropriate methodology based on the use of Linked Open Data and a dedicated ontology developed by the community. She also advocates for more transparency in 3D outputs and for the need to connect 3D projects to other linked digital resources, making them searchable and indexable. The scope of the chapters in Section 3 of Bodard and Romanello’s book lies outside the echo-chamber. All three focus on public engagement and crowdsourcing, on strategies and implications of making knowledge of the Classics accessible to people outside academia, and on how to engage the public in creating content. All three contributions present big platforms that provide accessible content but that also require input from the public in the form of annotations, transcriptions, as well as other interactions. Chapter 9, “The Perseids Platform: Scholarship for all!” by Bridget Almas and Marie-Claire Beaulieu, describes the collaborative editing platform Perseids, which gives all users the opportunity to contribute to the editing and annotating of ancient texts, and vets these crowdsourced contributions through a competent editorial board. The project is a successful and tested example of crowdsourcing for scholarship, and, like Chapter 5, demonstrates the value of using digital classics resources in the modern classroom. In Chapter 10, “Engaging Greek: Ancient Lives”, James Brusuelas describes the crowdsourcing website Ancient Lives, a collection of 1.5 million transcriptions of unedited Greek papyri. The website allows the simultaneous transcription of the same portion of text by different users and employs an algorithm modeled on DNA sequence alignment in bioinformatics to effectively “collate” different interpretations and create new editions of previously unread papyri. The closing chapter of Bodard and Romanello’s collection, “Ancient Inscriptions between Citizens and Scholars: The Double Soul of the EAGLE Project” by Silvia Orlandi, presents the EAGLE (Europeana network of Ancient Greek and Latin Epigraphy) project, which aims to make Ancient Greek and Latin inscriptions more accessible to academics, and the general public alike, through the use of two purpose-developed mobile applications. The chapter ends on a note that summarizes the message of the whole section: making information and interactive resources accessible to all helps to spread knowledge even as it raises public awareness of the importance of preserving our cultural heritage. All chapters include extensive bibliographies and color images. The book comes in an elegant hardback format or can be downloaded from the web for free at http://www.ubiquitypress.com/site/books/10.5334/bat/. Digital Classics outside the Echo Chamber is dedicated to the memory of Sebastian Rahtz (1955–2016), “scholar, archaeologist, humanist, geek”, whose premature demise left many in the field of Digital Humanities hungry for more of his genius.